Judicial Watch Finds 3.5M More Registered Voters Than Adults In U.S. In 2017, Judicial Watch’s Election Integrity Project examined the 2011-2015 data of two groups: the U.S. Census Bureau’s American Community Survey and the federal Election Assistance Commission. Deroy Murdock, a Fox News contributor and a contributing editor of National Review Online, tabulated Judicial Watch’s data and found 462 counties (18.5% of the 2,500 counties studied) where the registration rate exceeded 100%. Altogether, there were 3,551,760 more people registered to vote than the adult U.S. citizens in these counties — enough over-registered voters to populate a ghost-state about the size of Connecticut, according to Judicial Watch attorney Robert Popper. 101% registration rate in Delaware’s New Castle County. 108% registration rate in Georgia’s Fulton County. 112% registration rate (or 707,475 ghost voters) in California’s Los Angeles County. 138% registration rate (or 810,966 ghost voters) in California’s San Diego County. 154% registration rate in Washington’s Clark County. 162% registration rate in New Mexico’s Harding County, where there were 62% more registered voters than adult citizens. Murdock points out that in the 2016 presidential election, Hillary Clinton’s margins of victory in Colorado (136,386) and New Hampshire (2,736) were less than the numbers of ghost voters in those states, while Trump won Michigan (10,704) and North Carolina (173,315) by fewer ballots than ghost voters in those states. Dead voters account for some of the over-registration rate. In May 2016, KCBS-Los Angeles reported that 265 dead voters had cast ballots in southern California “year after year.” In October 2016, CBS Chicago compared local vote records with the Social Security Administration’s master death file, and found 119 dead people had voted a total of 229 times in Chicago in the last decade. In February 2016, Virginia Governor Terry McAuliffe (D), a Clinton crony, vetoed a measure to mandate investigations of elections in which ballots cast outnumbered eligible voters. Obama’s Justice Department actually filed a federal lawsuit to stop GOP governor Rick Scott from updating Florida’s voting records by deleting 51,308 dead voters. This entry was posted in Clinton and tagged Election Fraud, voter fraud on May 17, 2018 by Bone Fish. The number one reason Hillary won the popular vote – VOTER FRAUD. Voter fraud is usually perpetuated in Democrat states in heavily Democrat precincts. There the fraud is heavily insulated from discovery. Those who man the polls are Democrats, the election Commissioners are Democrats, the vote counters and handlers of voting machines are Democrats and the Secretary of State is Democrat. Democrats are notorious for having a blind eye to cheating – as long as it is done in their favor. So no, Hillary did not win the popular vote. This entry was posted in America and tagged Election Fraud, popular vote, voter fraud on November 17, 2016 by Bone Fish. A U.S. citizen has come forward offering conclusive proof of voter fraud in the recent Democratic primaries. Elliot Crown says that all of the NYC counties that Hillary Clinton won, were won using this special black box. After delving into the investigations of mathematician and numerical control engineer Richard Charnin, FBI journalist investigator Greg Palast and election investigator and analyst Bev Harris, an Italian observer of American politics becomes persuaded not only that statistical methods can show when fraud has taken place, but that in fact the American electoral system is structured to allow it and hide it. He unpacks some statistical concepts to explain this to his brother, a naturalized American, and he in turn passes the information to us. My brother Marcello and I have been talking about electoral irregularities for months. He’s an astronomer by training, a software engineer, and an avid follower of American politics. I’m a microelectronic engineer and a finance person living in the United States for the past 20 years. As Italians we both look at American politics with a great deal of curiosity and sometimes disbelief. As a naturalized American, I worry. Recently, Marcello became interested in the sort of calculation that could actually detect electoral fraud having heard about so many indications of electoral rigging in these past democratic primaries. After delving into the investigations of mathematician and numerical control engineer Richard Charnin, FBI journalist investigator Greg Palast, and election investigator and analyst Bev Harris, among others, he is persuaded not only that statistical methods can show when fraud has taken place, but that in fact the American electoral system is structured to allow it and to hide it. He spent a few days unpacking a few statistical concepts for me regarding this proposition and I will try to convey them to you. First we should be aware that exit polls, the polls of voters taken immediately after they have exited the polling stations, are the only way to check against fraud in elections while keeping the vote confidential. A discrepancy between the declared vote (recorded vote) and the vote extrapolated from the exit polls is an indication of fraud when it is above a margin of error of 2% within a confidence level of 95%. Here is how it works. When statisticians try to measure the ‘real vote’ they not only estimate the final vote count but they also analyze the entire distribution of the data they gathered from the exit poll voter sampling in order to determine the reliability of their final determination. When fluctuations in the data are due to randomness they will follow a statistical distribution that follows the shape of a bell curve, the Gaussian curve. The reliability or unreliability of the sample data doesn’t depend so much on the trustworthiness of those who collect the exit poll voter sampling, but it’s rather intrinsic to the shape of the distribution. From this shape an ‘interval of confidence’ is determined within which we can unquestionably claim our confidence that we got it right with a probability of 95% — always 95%. This interval of confidence is also called ‘margin of error’ (MoE). Poorly informed ‘experts’ frequently argue that the statistical analysis of exit polls can be misleading because it assumes that real life data is randomly distributed (as in the Gaussian curve) when that’s not always the case. And here is where they are missing a central point. The expectation that sample data will be randomly distributed ALREADY takes into account all possible relevant factors in a practical observation in real life. When extraneous factors intervene, a discrepancy will make the recorded value fall outside of the interval of confidence signaling only one possibility: a systematic error. When this occurs statisticians make further analysis to determine the causes, and either remove the cause or include it into the ‘margin of error’. After 59 years of fine-tuning this process in countless elections around the world statisticians have reached a point where exit polls have become extremely reliable. If the final ‘Recorded Vote’ falls outside the interval of confidence one can assume with a high degree of certainty that the systematic error is intentional. This is why we say that we have a high probability of fraud. The fact that such a high probability of fraud is so apparent in the comparison of exit polls and recorded vote is partially masked by the way electoral results are obtained in the United States. The results of most democratic elections around the world are obtained with a 95% confidence level within a margin of error of 2%. In fact, these are the parameters that the U.S. government normally uses to oversee elections in other countries (https://en.wikipedia.org/wiki/List_of_controversial_elections). But this is not true in the U.S itself — which nobody thinks of supervising. Election results in the United States are obtained with a 95% confidence level within a 3-4% margin of error. This is because relatively recent laws in the United States have intentionally rendered reference data less reliable (HAVA, Bush 2002). By law exit polls must be adjusted to match the final recorded vote, which means that evidence of fraud is suppressed. Exit poll results, already partially manipulated, must disappear after a given election and become public only 5 years later. When such data has become available in its unadjusted complete form, it has been used to cross-check voting results with other independent methods. The results have not only shown that the numbers were internally coherent but also that they corroborated original suspicions of fraud. In the 2016 democratic primary elections unadjusted exit polls show that Bernie Sanders has been robbed of the following percentage of votes: Alabama 6.1%, Arizona 22.1%, Georgia 5.5%, Massachusetts 4.0%, Mississippi 4.7%, Ohio 5.0%, South Carolina 5.2%, Texas 4.2%, Wisconsin 6.9%, West Virginia 6.0%, New York 5.9% (CNN New York exit polls indicated that Bernie Sanders may have done better than 48% there). Although a discrepancy of -4.6% in Oklahoma turned out to be in favor of Bernie, it doesn’t affect our analysis because so far the discrepancies shown in all of the above final results have been consistently larger than the MoE in favor of Hillary in 11 of the 26 primaries. The probability of this happening without fraud is 1 in 77 billion (6.8-sigma). In other words, one can expect something this improbable to happen less than once since the extinction of dinosaurs — if elections were to be a daily event. Exit polls discrepancies: 24 out of 26 are in Hillary’s favor exceeding the margin of error in 11 primaries. One can also search for trends to check for fraud. One of the most revealing methods, the Cumulative Vote Share Analysis, searches for a correlation between the size of a discrepancy (between recorded vote and exit polls) and the size of a precinct. When no fraud has taken place the trend tends to be quite regular. When the discrepancy tends to manifest as the size of the precinct becomes larger than a certain value, it is a strong indication of fraud, according to Richard Charnin. Roughly speaking the reason for this behavior is that electronic rigging is implemented strategically in order not to become obvious. The discrepancy caused by the rigging is “better” distributed between those precincts that are big enough to be worth the effort. Above a certain precinct size the vote share increases in favor of one candidate. There should be no correlation, like we see on the diagram on the left (Utah). In fact, in the recent democratic primaries we can observe a noticeable divergence in trends between the Clinton and Sanders votes when the precincts are larger; the larger the size, the higher the percentage of the votes that go in favor of Clinton. This has been evident in Massachusetts (>10%), Michigan (>3%-10% according to the type of machines), Missouri (>0.05% the size is small but the trend unequivocal), New York (>10% and possibly >20%). Charnin’s diagrams (see below) are self-explanatory. In Kentucky Hillary’s cumulative vote share increased by 7.4% (55.9% to 63.3%) after 85% of the smaller precincts were counted! The probability P of this vote spike occurring by chance is essentially ZERO. All in all electoral anomalies have been apparent in New York, Massachusetts, Illinois, Arizona, Iowa, Nevada, Ohio, Delaware, Wyoming, Wisconsin, Missouri, Michigan, Alabama, Tennessee, Georgia, Arkansas, Texas, Kentucky and Oregon. But electoral fraud has been particularly evident in strategic elections such as those in Arizona and New York. They were meant to kill the Bernie Sander’s momentum. And they did just that with the help of the media. Disenfranchisement — widespread in New York and Arizona — has been more widely reported so I will not discuss it here. But in any case it must be added to other forms of electoral fraud. According to the recorded vote the Sanders-Clinton competition is currently at 43.5-56.5% with a lead of 3 million votes in favor of Clinton. But actual votes in caucus states have not been included, and the fact that unadjusted exit polls have indicated that voting machines were hacked has not been considered. According to Charnin, if we take this into account we would have Sanders at 47.9 and Clinton at 52.1%, with a lead of 1.3 million votes in favor of Clinton. Furthermore, if we also take into consideration that voter rolls were manipulated and that long lines and severely shortened polling station hours reduced voter turnout in areas favorable to Sanders, we would need to add a 10% to Sanders’s votes and subtract 5% from Clinton’s. That would put Sanders in the lead at 51.5-48.5% with a lead of 780,000 votes in his favor. Sanders’s supporters have barely begun to speak about electoral irregularities and already the DNC has started to accuse them and Sander’s campaign of inciting “violence” among supporters by promoting allegations that the primary process is rigged in favor of his opponent, Hillary Clinton. There’s much more to say. This is only a piece of the larger story of how fraud has become part and parcel of American elections, which has been at work since the 1960s, reaching extraordinary highs after the year 2000. Most notable have been the elections stolen from Al Gore by 6 million votes, from Kerry by more than 10 million and the landslide vote margins stolen from Obama both in 2008 and 2012. But if until now the biggest share of electoral rigging has come from the Republicans by far, it looks like the Democrats are more than willing to step up to the plate if an un-corrupt candidate dares to challenge their establishment. This entry was posted in Clinton, Government, Tyranny, Uncategorized and tagged Clinton, Hillary, Hillary Clinton, voter fraud on August 3, 2016 by Bone Fish. “I think we have widespread voter fraud, but the first thing that Trump needs to do is begin talking about it constantly,” Stone said. “So, I mean the dream here, the ultimate ideal is that he wins by such a significant margin nationally that this is unnecessary,” Yiannopoulos concluded. “But it’s interesting to hear you say this, and it’s funny also, because Trump will go there. He will go to the places other politicians wont, and he’s probably the only person to run for president within the last fifty years who would dare to do this, and might even get away with it. It’s remarkable isn’t it how he’s just sort of re-injected reality into politics”. Just in case you thought things could not get any more obvious among the riggers, does this look ‘normal’? July 25: Trump was at 48%, Clinton at 45% in CNN/ORC poll. Today: Hillary Clinton leading Donald Trump 52% to 43% in CNN/ORC poll. Perhaps the biggest swing in a week in US election history? This entry was posted in Clinton, Trump and tagged Clinton, Diebold, Donald Trump, Election Fraud, Hillary Clinton, Roger Stone, Trump, voter fraud, voting machine on August 2, 2016 by Bone Fish. Democrats manipulate polling numbers to make it easier to steal elections without the public realizing the voting machines were rigged. In 2008 the leftwing media hype declared that Barack Obama was more popular than Muhammad Ali and Harriet Tubman combined. He wasn’t. The leftwing media also claimed that Obama generated the largest young vote in history. They lied. What the vote thieves love about electronic voting machines is that they leave no trace of where the votes were stolen from. They only record totals, not trails. But when you have 35 million more votes than voters the one thing you do know is that the overages are votes by theft. But later, as Obama planned for the Election of 2012, journalists noted that Obama hoped to attract the minority votes who failed to materialize in 2008. Without going into detail, the same thing happened in 2012. Federal law requires the conspicuous posting of the following: the number of registered voters in the country; the number of registered voters who voted; the percentage of registered voters who voted, and, finally, the number of votes cast. In 2012 Obama used his own made-up FEC election returns form so you could not look at it and see the vote fraud. The data which was required by law to be conspicuously posted, now appeared to be spread out, and reported separately in different media, concealing—as best they could—the fraud. In 2012, 90,682,968 registered voters somehow delivered 126,985,809 ballots. Of them, 36,302,841 were fraudulent votes. Obama won by 6 million votes. The Democrats datamined 6 million GOP votes in 2012. What that means is that, in 2012, even by dismissing the 36.3 million stolen votes, had the Democrats not illegally voted 6 million American voters, stealing their right to vote by casting that person’s ballot before election day. Obama would still have lost the election by well over 6 million votes (i.e., taking 6 million off Obama‘s total and adding that amount to Romney‘s. By the way, thanks to Virginia Gov. Terry McAuliffe, the political shyster who masterminded the art of datamining both Democrat and Republican voters when he was Chairman of he Democrat National Committee during the Clinton years, used datamining in 2012 to early vote Republicans, casting those ballots for Obama. While I don’t think datamining the Republican voting history is illegal, I know that posing as someone else and early voting their name is a felony. Now, thanks to a Washington State grandmother and Democrat voting advocate, we now know for a fact that the voting machines triggered massive electronic vote fraud in 2008 and 2012. On July 21 California-based attorney Dr. Orley Taitz cited that there has been a noticeable shift in polling positions since April when twice as many people polled said they would most likely vote for Clinton over Trump. On July 13 the Rasmussen Poll showed Trump leading Clinton 44% to 37%. The LA Times-USC poll (the third most liberal newspaper in the country, puts the July 13 poll as Trump-43%, Hillary 42%. Imagine that. Even in La-La land, Hillary loses. Lawyer Taitz noted in her “Defend Our Freedom Foundation” website that Fox News contributor, left-leaning RealClearPolitics.com collaborator, and one of the founders of left-leaning Wikipedia, Larry Sabato (who Fox News considers to be the guru of polling averages) was caught removing polls from the RealClearPolitics.com website which showed Trump leading Clinton. Taitz said Sabato was observed removing the July 19 LA poll from the site. Taitz said she personally wrote to RealClearPolitics.com and demanded that they add the LA Times poll (which shows Trump leading) back on the site. If Orly is correct (and she does her due diligence very well) and RealClear is deleting or failing to acknowledge every poll that favors Trump, then it’s easy to see why every major media company in the United States is fostering the falsehood about how good Hillary is doing and, conversely, how bad Trump is doing.) According to Taitz, the website put the LA Times poll up—for all of 24 hours. The following day, she understood, someone “…leaned on them…” and the poll was taken down. Today, according to the Quinnipaiac University Poll (7/13) Trump held a 3% lead in Florida (42 to 39%); a 2% lead in Pennsylvania (43% to 41%) and tied with Clinton in Ohio with 41% each. Peter Brown of the Quinnipaiac University Poll noted that Trump went into the Republican Convention with a slight lead in three of the most important swing States in the race. But, you aren’t hearing that on Lie TV (not Li”v”e TV—leftwing TV) where tongue-in-cheek spinmeisters believe you are buying their garbage rhetoric when they tell you how bad Trump is doing and how well the “Queen Liar” is doing. The liberal media will never give a non-liberal candidate unbiased coverage. Trump‘s much maligned (by the Washington Post) acceptance speech surprised the left. They felt—and hoped—that presidential nominee Trump would pepper his acceptance speech with the anti-establishment and anti-competitor rhetoric used by challenger Donald Trump. When he didn’t, Trump frightened the Washington Post‘s editorial team that’s already having a hard enough time ignoring Clinton‘s sins and crimes, knowing that when Trump returns to campaign mode the Trump rhetoric will once again slice and dice his opponent, forcing the media to examine the sins and crimes of Hillary Clinton—or discover that not even Jeff Bezos‘ vast Amazon.com fortune can keep them alive without readers. Interestingly, when the Justice Department announced it was not going to prosecute Hillary Clinton for violating 12 federal laws dealing with mishandling federal documents (18 USC § 371, 18 USC § 641, 18 USC § 793. 18 USC § 798, 18 USC § 1031, 18 USC § 1343, , 18 USC § 1346, 18 USC § 1505, 18 USC § 1519, 18 USC § 1924 and 18 USC § 2071 which prohibits anyone convicted of this crime from ever holding any job in the federal government—including the job as President of the United States) Hillary‘s standing in the polls in Florida dropped when that news report hit the small screen. This suggests some Florida Democrats who likely want to believe she’s innocent, also felt she should face a federal court judge and show why she’s not guilty of the allegations from the GOP leadership in Congress. It will likely drop even more based on how the leftwing print media handles the early CNN and Fox News story on Wikileak’s release of some 20 thousand emails between the Clinton campaign hierarchy and the Democratic National Committee and from the DNC to Clinton campaign managers on strategies to undercut Bernie Sanders and torpedo his campaign. As the Republican and Democratic Campaign of 2016 ramps up, the media will highlight the sins of Donald Trump as it conceals the crimes of Hillary Clinton. In doing so, they will also erase any poll which shows The Donald is leading so when they use labor union controlled electronic voting machines in about 82% of the polling places in the country, and steal 40 million or more votes through rigged voted machines, they can tell the American people the vote turned out the way the polls said it would. 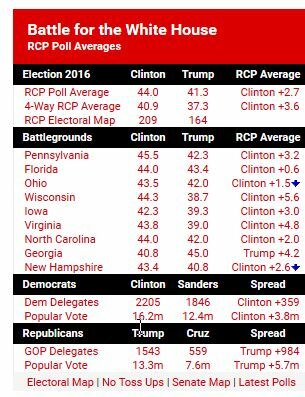 Nothing happened that the polls didn’t predict, particularly the liberal media fraud. This entry was posted in America, Clinton, Government, Trump and tagged Bill Clinton, Election Fraud, Hillary, Hillary Clinton, voter fraud on July 28, 2016 by Bone Fish. The shocking footage shows a citizen walking up to the machine and attempting to vote for Sanders two different times, with each vote being credited to a candidate named Michael Steinberg. A disturbing video from a polling location in Alameda County, California is an example of what might be a Smartmatics or Diebold type machine programmed to flip the vote without anyone allowed to examine or verify the software code settings. Smartmatics and Diebold are part of the UniParty DC regime – and provide the electronics to Brasil, Britain, France, Syria, Venezuela, Utah (that is how Ted Cruz won over TRUMP, even though his polls showed 20% max, prior to the election). Populist candidates have no chance, neither does the “public”. George Soros is close friends with the Chairman of Smartmatics and provides the machines for “FREE” to any gubbermint wanting to be the winner. Diebold is part of the CIA. This entry was posted in America, California, Clinton, Government, Obama, Politics, Trump, Tyranny, Uncategorized and tagged CIA, Diebold, electronic voting fraud, Smartmatic, voter fraud on June 8, 2016 by Bone Fish.